With so many Tex-Mex Restaurants in the whole of Houston, it’s definitely difficult to make a top 15 of the best, but I did it. Here are some of the best of the lot – I’m sure many will agree with most in the list as they clearly offer the finest mix of Mexican cooking and Southern American cuisine. El Patio’s most popular fares are Tex-Mex classics like the fried Sunrise Enchiladas, an all-time favorite dish of former owner Ana Villasana. El Patio has grown immensely both in flavors and patronage during Villasana’s time, and so the present owners continued with its old tradition by using the restaurant’s original way of cooking its well-loved Tex-Mex dishes. Indeed, Tex Mex is what’s embodied in this Arkansas-based restaurant. Go and visit the Chuy’s joint for the finest service you can enjoy, where staff are more than eager to serve their guests. Combos are a delight as they are delicious and filling, while easy on the budget. Don’t miss its enchilada and taco, two dishes that are everyone’s favorites. Its chicken chalupa is also a fine option for a tasty dinner. For the best puffy tacos and chili gravy-topped tamales, head to El Real Tex Mex Café. It is known for its old-fashioned Tex Mex meals, where every dish shows total authenticity because of the efforts of its owner Robb Walsh. Here at El Real, you can have a taste of the finest fajitas as well as its skirt steaks, the deliciousness of which rivals that of any other steak house this side of Houston. El Tiempo is a standout as a Tex-Mex Restaurant, with its sizzling beef fajitas as some of the best dishes around. It offers modern fares like the honey-anchovy glazed quail and avocado cannonballs, which is basically the fruit portioned to little bites, stuffed with cheese and shrimp, and deep-fried to perfection. Another true-blue Tex-Mex joint, the Escalanta was inaugurated in 1993 by Patrick Torres of the Guadalajara restaurant fame. The restaurant’s dishes are noticeably lighter and more sophisticated compared with the older restaurants of similar offerings. Some of its popular dishes are the escaveche of shrimps, fish, and avocado, and the fajita relleno, which is pepper stuffed with cheese and wrapped around by fajita meat. In this restaurant, everything seems laidback contrasted by unusual goings-on such as a Mexican singer delivering a popular Spanish piece, and young women creating the restaurant’s fresh tortillas by the dining area for everyone to see. 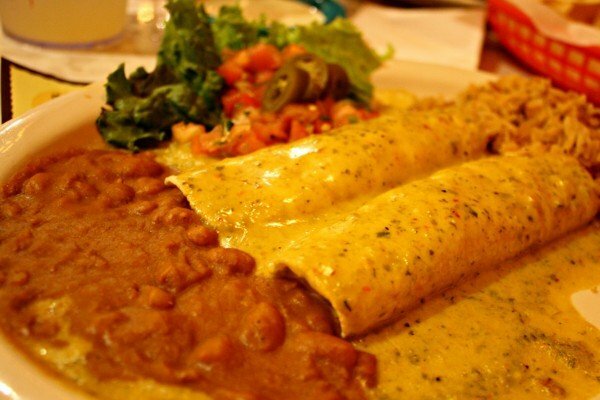 Enchiladas are what makes everyone satisfied as they spend dinner time in this Tex-mex joint. If you do dine here, order enchiladas with red salsa, and some fried potatoes and carrots on the side. At Russell Ybarra’s Gringo, you can enjoy family dining at its finest while treating everyone with some of its tastiest Tex-Mex fares. If affordable and authentic Mexican food is what you’re looking for, then you must order its Presidente Combo plate, complete with cheese enchilada, chile con queso guacalamole – all for a mere $11. A wholly family-operated restaurant, Lupita’s is popular for the freshest tortillas this side of town. They are made from the recipe of the owner herself, Lupe Garcia. Every day, everything is made from scratch. The restaurant assures that all ingredients used to create the meals are fresh and high-quality. Want to see Lupita? Catch her making tortillas with her husband and sons. Molina’s has been a dining tradition for many in Houston since 1941. Famous for its Mexico City combo meal, you will have your fill with its big plates of enchiladas, tamale, tacos, and sides. Visit Molina’s, and by chance, you might be seated near a famous guest, like the former US president George H. W. Bush, perhaps? What’s the best to have at Ninfa’s, but its fajitas and creamy green sauce? With its able chef in the person of Alex Padilla, you are bound to enjoy its innovative Tex Mex dishes, while having some fine drinks from its varied cocktail collection. Its grilled salmon is sure to melt a fish-lover’s heart. The original fajitas of Ninfa’s are still available, which you can savor along with skirt steak and fresh tortillas. It’s a pleasure to visit the restaurant if only for its terrific, authentic Mexican food. “Make fajita that impresses” must be the motto of everyone behind Pappasito, and indeed, they have been achieving that. Basic food is the restaurant’s strength – and so it is a must to have a taste of many listed on the menu, like guacamole, beef nachos, and fajitas of course. Many troop to Tex-Mex restaurant for its Enchiladas-a-la-Taylor, a main dish that guests must enjoy with tequila con margarita. Perhaps you dig chalupa more, which in this case, you must try its large platter of Chalupa-A-La-Bales that you can pair with other dishes or simply eat with a glass of margarita. This restaurant probably serves that best enchilada in town. I know folks from far beyond Sylvia’s vicinity visit the place for this particular Southern Texas fare. A delicious treat many guests can’t get enough of is its quail grilled in mesquite. Still another popular fare is Sylvia’s home-made fideo soup, which is the Tex-Mex version of the chicken noodle soup. Teotihuacan is popular for its lively patio and mural of Mayan theme. When it comes to Tex-Mex, go for its special enchilada that’s ideally eaten with strong margaritas. For those looking for some fish meal, a great choice is the snapper with cilantro and meunière sauce. Another fantastic Tex Mex Joint is Tony’s Restaurant, which is five stars as far as customer service is concerned. Overall, the Texan-Mexican feel is what dominates the air, and made stronger with the great food that it serves. For instance, its Tony’s enchiladas are a huge favorite among loyal customers. Best eaten in chili gravy and lots of melted cheese, you can finish it with a mug of cold draft beer.